Ideally situated on Chevron Island, Karana Palms Resort is just a short stroll from the heart of the Gold Coast’s renowned entertainment playground, Surfers Paradise. 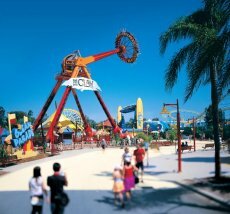 Here are just a handful of the great attractions within easy reach of our Surfers Paradise resorts. Enjoy laid back afternoons browsing the countless stores and fashion boutiques that line nearby Cavill Avenue, head down to Chevron Renaissance shopping centre where you can dine, see live entertainment and shop at designer fashion stores. Food lovers will discover gourmet treats from all over the world on offer at the city’s diverse cafes and restaurants, with something to suit all moods, tastes and budgets. Those that like to party all night can immerse themselves in the renowned local nightlife scene, or take the short drive to the iconic Jupiter’s Casino for 24 hour glamour and excitement. With its 3km of sweeping golden sand and sparkling, temperate surf, it is not hard to see why Surfers Paradise Beach is one of the most loved beaches in Australia, if not the world. If you can drag yourself away, you can spend invigorating days amid lush tranquil rainforest in the Gold Coast hinterland, located just a short drive from our self contained apartments Gold Coast. The Gold Coast is home to a fantastic selection of world class theme parks, all of which can be reached quickly and easily from the resort. Test your nerve on the infamous Big 8 thrill rides at Dream World, swim with sharks at Sea World and witness hair-raising live stunt driving shows at Warner Brothers Movie World!